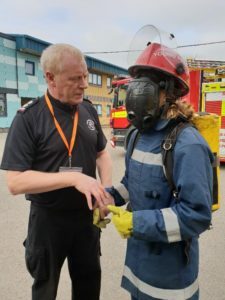 As part of our Level 3 BTEC Uniformed Public Services offer we have been fortunate enough to host teams from the Northamptonshire Fire Service and the Royal Navy (Specialist Catering Service and Royal Marines) over the last 2 weeks. 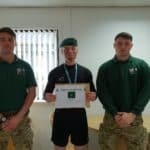 The course offers sixth form students the opportunity to study a subject equivalent to A Levels as well as providing them with opportunities that cannot be accessed without recruit training. The visitors have provided fascinating insights into public service work and shared how varied day to day roles can be as well as the opportunities that can be offered. I think it is fair to say that our students have loved and hated the experiences in equal measure! A student navigates through the caged, enclosed space. A student is briefed prior to the enclosed space test. In this test recruits would have to navigate around a caged area without one of their key senses (sight). 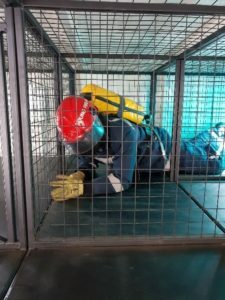 They are dressed in Fire Service clothing and have to carry a replica oxygen tank on their back which makes navigation through the series of cages more difficult. 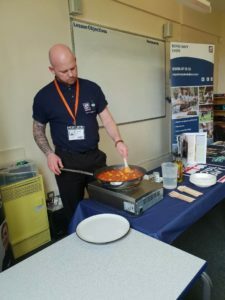 Mattie from the RNSCS demonstrates how to cook Paella. Students get to sample the scran! Students received a practical demonstration showing that a nutritious meal can be cooked with basic equipment. well as hearing about the benefits of Naval service including pay, sport, travel, education and training. 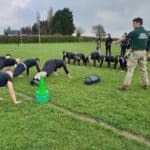 Students were put through their paces when the Royal Marines Visibility Team visited with a series of punishing team PT challenges. 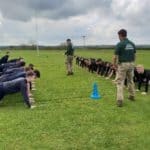 Students also got the opportunity to learn about field craft, cam and concealment and were given an insight into day to day life as a Royal Marine.